After seven months as interim chief, Vicki Christiansen is now chief of the U.S. Forest Service. U.S. Secretary of Agriculture Sonny Perdue performed Christiansen’s swearing-in ceremony on Thursday in Washington, D.C.
“As a former wildland firefighter and fire manager, Chief Christiansen knows what’s needed to restore our forests and put them back to work for the taxpayers. 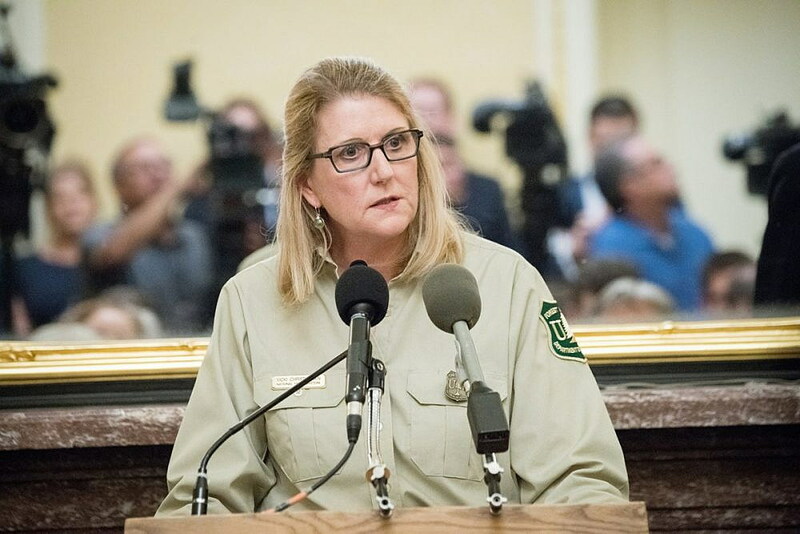 With seven years at the Forest Service and 30 years with the states of Arizona and Washington, Vicki’s professional experience makes me confident that she will thrive in this role and hit the ground running,” Perdue said in a statement. Christiansen joined the Forest Service in 2010 as the deputy director of Fire and Aviation Management after serving as the director of the Arizona Division of Forestry. For the past few years, Christiansen worked on the National Cohesive Wildland Fire Management Strategy, which prioritizes making communities more fire-adapted and getting agencies at every level to work together. She took over as interim chief in March after Chief Tony Tooke resigned under allegations of sexual misconduct. Christiansen was recently in Missoula as the keynote speaker for the 24th annual Fire Continuum Conference at the University of Montana. She underscored the need for the Forest Service to acknowledge that wildfires are going to increase so the agency needs to get more proactive rather than reactive in its approach. “If we think what worked for us for the last 100 years is going to work for us the next 100 years, we might as well fold and go home because I don’t see success,” Christiansen said. Ticking off the realities that complicate firefighting – longer fire seasons, bigger and more severe fires, a warming climate and more homes being built in the wildland-urban interface – Christiansen said the Forest Service faces “gnarly” challenges. But almost 10 years ago, agency wildfire experts set out to develop a new national strategy for dealing with the expanding threat. In 2014, they presented the Cohesive Strategy with three goals: restore healthy forests, create fire-adapted communities and develop an effective, safe, risk-based response. That means evaluating landscapes and creating possible plans of action before fires begin to burn. All three goals need to be achieved – and soon, preferably before the next megafire, Christiansen said during her Missoula talk.